The Temple is only a matter of about 2 miles from the centre of the City, about half a mile before you get to the Airport. If you're not in a Coach Party I would suggest a Taxi, to walk there you encounter roads with very heavy traffic. Pashupatinath Temple is regarded as being one of the most significant Hindu Temples of Shiva in the World. 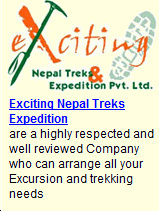 It covers a very big area and like many other places in Nepal caters for other Religions as well. Only believers in Pashupatinath (mainly Hindus) born in Nepal or India are allowed in the main Temple. The River Bagmati which runs through the Temple complex is also highly sacred so you will see quite a few 'Ghats' (bathing places) where many Pilgrims to the Temples bathe with faith that the holy waters will be of spiritual benefit to them. On the east side of the River is the Crematoria. When viewing this we must remember the Culture and Religions have differences to ours. The passed away bodies are cremated quite openly. When people pass away it is seen that wherever possible Cremation should take place either before dusk or dawn that day, whichever is the nearest. Only men attend the Cremation itself, you will see the closest relative male in white trouser garments. Mourning someone lasts for 13 days (sometimes more), the time it is said for the deceased to reach their destination. At Pashupatinath there are two areas for cremation, the one on the south side of the footbridge is for lay people and the area to the north side is for dignitaries such as Politicians, Members of Armed Services and any other 'VIP'. You are sure to come into contact with some Sadhus, holy Hindu people. The true Sadhus (it is said that some are for Tourists) either live in the Temples or Caves. The Sadhus at Pashupatinath will gladly let you sit with them, place Tikka to your forehead and have a photo taken with them, but it is common practice for you to make a donation should they do this. Bear in mind it is quite common for them to be found smoking 'a drop of the hard stuff'! My Guide around the Temple said the true Sadhus are those at the top of the hill on the east side of the River (see Photo Gallery). Something which strikes any visitor is that all the Temples in Nepal are very active and not just historic show pieces for Tourists. In and around the Temples you will see many things going on from blessings to prayer. To tour the Temples allow yourself at least two to three hours. No harm in being a Tourist sometimes!